It’s the finest soundbar on the market. But for the money, is it better than conventional surround sound? It is without a doubt the best soundbar ever conceived, but that doesn’t make it the ultimate choice in immersive audio for a high-end home theater. Creative has built the best soundbar ever made. It’s probably better than what any other soundbar manufacturer has dared contemplate. 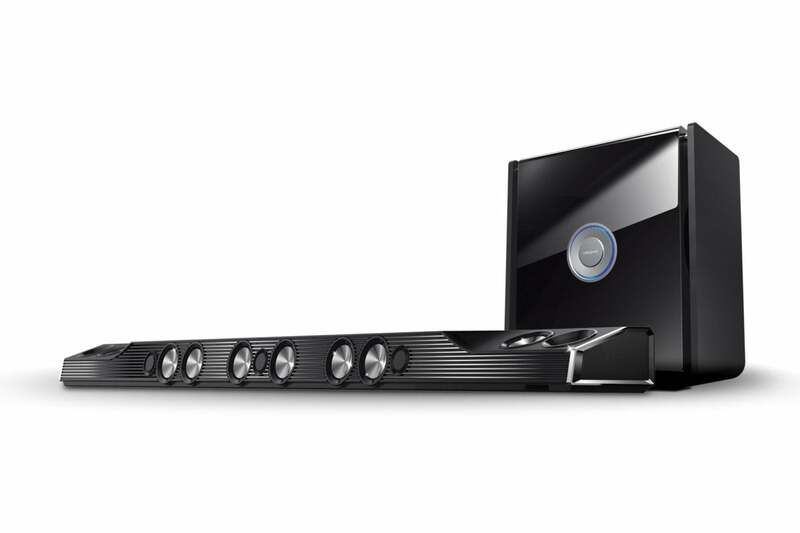 It’s an audio system that’s so over the top that calling it a mere soundbar is an injustice. But I’ve yet to hear any soundbar at any price—and this one costs nearly six grand—that delivers the theater audio experience as effectively as a component system, and the X-Fi Sonic Carrier is no exception. 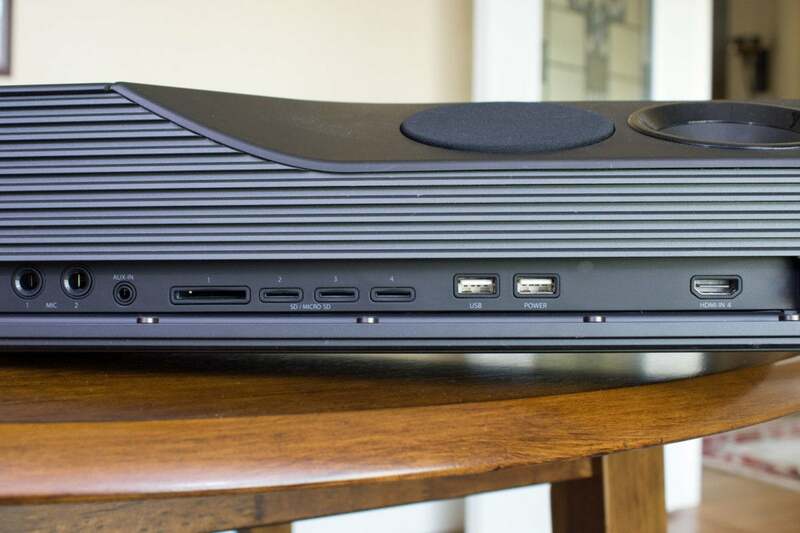 This review explores the X-Fi Sonic Carrier in substantial detail. If you just want my one-sentence opinion, scroll to the bottom of the page. A soundbar like the Sonic Carrier, however, offers one huge advantage over component audio systems: A dramatic reduction in the number of cables you need to deal with. I was in the process of reviewing Focal’s $1,299 Sib Evo Dolby Atmos speaker array with a $799 Onkyo TX-NR737 A/V receiver when the Sonic Carrier arrived (I decided to push the Focal review to a later date). A top-mounted upfiring tweeter and mid-range bounce height audio cues off your celing (the left side is shown here). Even though the Sib Evo incorporates the Dolby Atmos height speakers into the same cabinets as the front left and right speakers, I still had to measure, cut, strip, and route seven sets of speaker wire, plus one RCA cable for the subwoofer, to set up that configuration. The only wires the Sonic Carrier needs are the ones from your sources (e.g., an HDMI cable from your Blu-ray player), and the HDMI cable to your TV. You do temporarily hardwire the subwoofer to the soundbar, but that cable is removed after the initial setup. 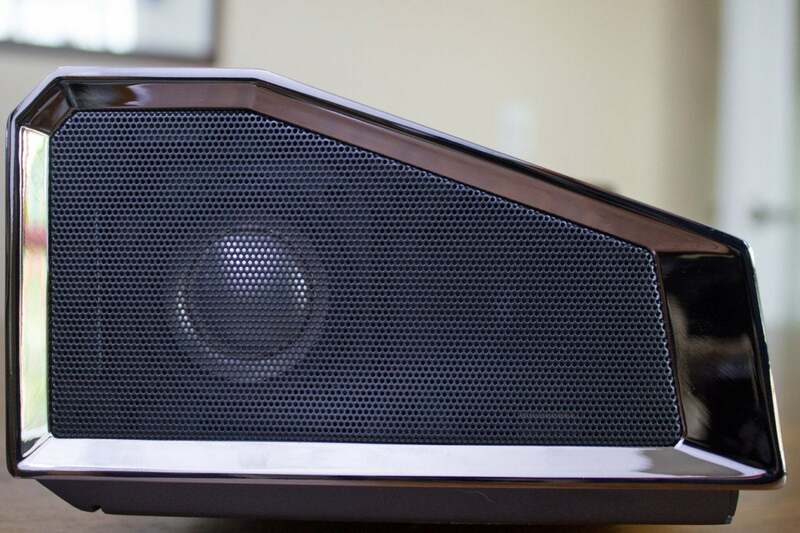 The Sonic Carrier is a hulking beast of a speaker. Should you decide to use the provided mounting brackets to hang it from a wall, you’ll want to be certain that it’s anchored to the studs behind your drywall with very long screws: This monster measures 59.9 inches wide, 5.9 inches deep, and 3.8 inches high. Its frame is fabricated from anodized aluminum, but you’ll still need two people just to remove its 35.3-pound bulk from the box. 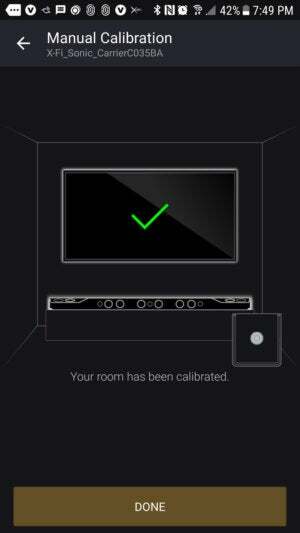 The X-Fi Sonic Carrier relies on the mic in your mobile device for room calibration. Creative describes it as an 11.2.4 speaker configuration, which is a little different than how Dolby classifies Atmos systems. 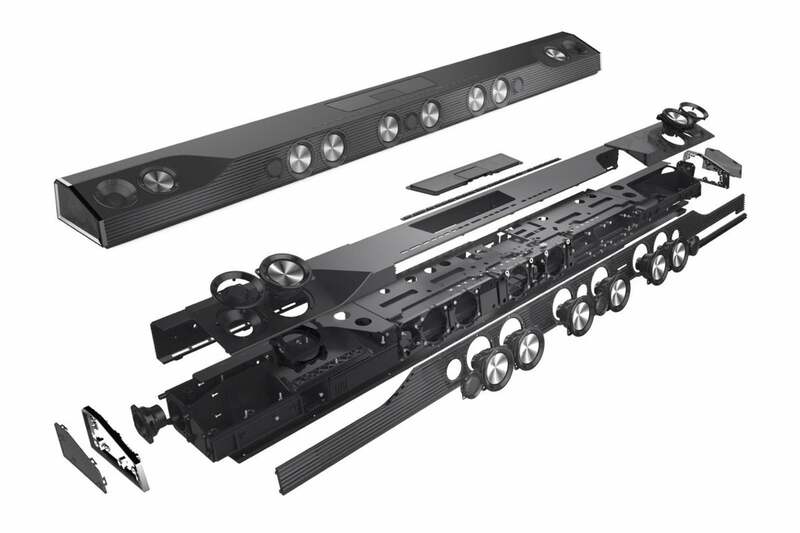 The .2 in Creative’s figure represents height speakers, and the .4 indicates the number of supported subwoofers (the system comes with one, and you’d need a room the size of a stadium to need more than that). Dolby would describe this as an 11.4.2 system. In any event, each of the Sonic Carrier drivers are independently controlled by an EAX 15.2 digital signal processor (DSP) to produce 16 directional outputs (nine front-firing, two side-firing, four up-firing, and one for low-frequency effects or LFE). Each driver is powered by a discrete Class-D amplifier. The amps in the soundbar itself produce a combined 400 watts RMS, while the sub is outfitted with a pair of 300-watt Class-D amps. Independent driver control might be important, because you’ll calibrate the system for the specific acoustic characteristics of your room. It’s hard to evaluate the effectiveness of that calibration, however; the fact that it relies on an app running on—and the microphone in—your mobile device casts a shadow over the concept. Dedicated A/V receivers (from midrange on up) have onboard calibration systems that utilize custom microphones, so the calibration software is tuned to the hardware and knows exactly what to expect. 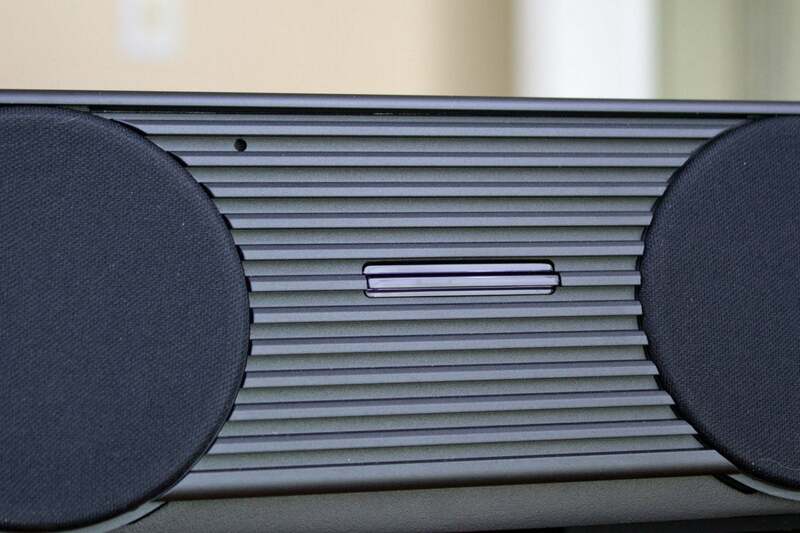 Side-firing 2.25-inch aluminum-alloy full-range drivers mounted inside the Sonic Carrier’s left and right end caps handle surround-sound duties. In a traditional 5.1 home-theater speaker system, this would be handled by discrete speakers positioned near your listening/viewing area. The front-firing speakers for front-left, -right, and -center consist of three 1-inch aluminum-alloy dome tweeters and six 2.75-inch, aluminum-magnesium mid-range cones. 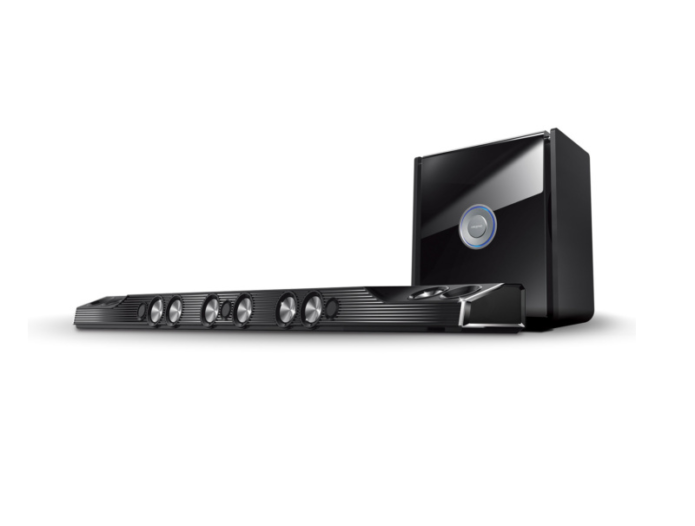 In a conventional home-theater system, you’d have a stereo pair for left and right and a third dedicated speaker for the center. Full-range speakers in the soundbar’s end caps handle surround-sound duties. A pair of 1-inch aluminum-alloy tweeters, along with two more 2.75-inch midrange drivers, fire up from the top of the speaker, bouncing height audio cues off your ceiling. In a conventional 5.1.2 system, these speakers would be mounted in your ceiling firing down (and a 5.1.4 system would add a pair of height speakers to the back of the room). It wouldn’t be a home theater system without a subwoofer, of course, and Creative really goes the extra mile on that score. The X-Fi Sonic Carrier ships with one equally massive powered sub, but it’s capable of pairing with four of them—wirelessly, no less (additional subs cost $2,199 each; $2,699 for the piano-black finish). As I mentioned earlier, you need to connect the components with a cable during the initial installation, but you remove it once pairing is complete. The sub is 22.9 inches high, 20.9 inches wide, by 12 inches deep. Make sure the friend who helped you place the soundbar sticks around long enough to help you place the sub: It weighs 60 pounds. The controllable multi-colored LED light ring on the massive subwoofer is one of the X-Fi Sonic Carrier’s more gratuitous features. The sub consists of a pair of 300-watt RMS Class-D amplifiers, with each one driving a 10-inch, paper-cone-with-rubber-surround high-excursion woofer. The woofers are mounted in an MDF enclosure and arranged in a push-push configuration (i.e., the woofers are mounted back to back). They’re mated to a pair of flared ports. Creative reports frequency response of 150Hz to 40kHz for the main unit, and frequency spot of 25- to 150Hz for the sub. 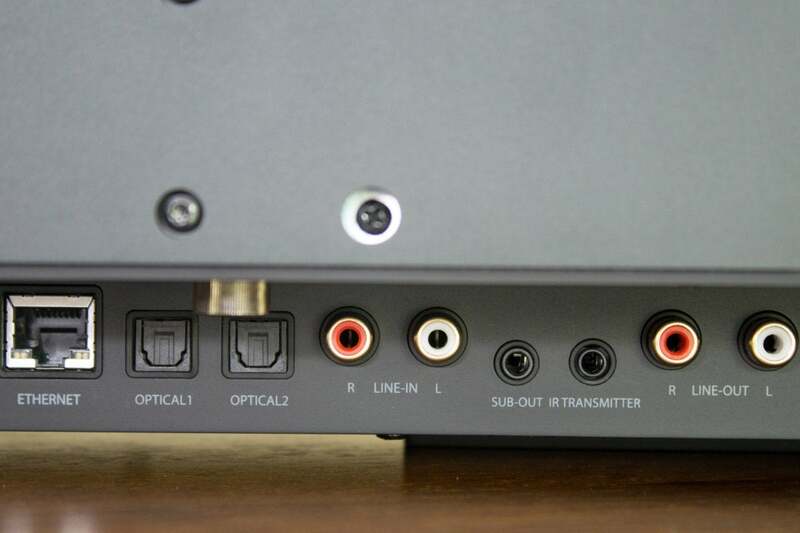 Most better-quality soundbars have at least two HDMI inputs and at least one HDMI output with ARC (audio return channel, for sending your TV’s audio back down the cable to the speaker). They’ll also support at least one analog audio source and be outfitted with at least one digital audio input (typically of the optical variety). The X-Fi Sonic Carrier has four HDMI 2.0a inputs, each of which supports HDCP 2.2 copy protection, and one HDMI 2.0a output with ARC. There are two Toslink optical inputs for digital audio sources, two sets of analog stereo line-level aux inputs (RCA), one analog stereo 3.5mm aux input, two ¼-inch inputs to support dynamic microphones for karaoke, and one set of analog stereo line-level outputs (RCA). Creative thought of everything you might want, except for coaxial digital audio input/output and a 12-volt trigger for something like a video projector screen. Need to connect even more music sources? There’s one SD memory card slot, three MicroSD card slots, and two USB 2.0 ports for hosting thumb drives and/or portable hard drives (storage can be formatted FAT32 or NTFS). A third USB port is dedicated to providing power. Should you want to charge your smartphone or tablet, this port puts out a full 5 volts and 2 amps. The two mic inputs, one of the 3.5mm aux inputs, one of the HDMI inputs, one of the USB ports, the four memory card slots, and the USB power port are in the front of the unit, discreetly hidden behind a drop-down panel, where they’re conveniently accessible for temporary connections. This hidden drop-down panel in front conceals (from left to right) two 1/4-inch mic inputs, a 3.5mm analog aux input, an SD card slot, three microSD slots, a USB data port, a USB charging port, and an HDMI input. 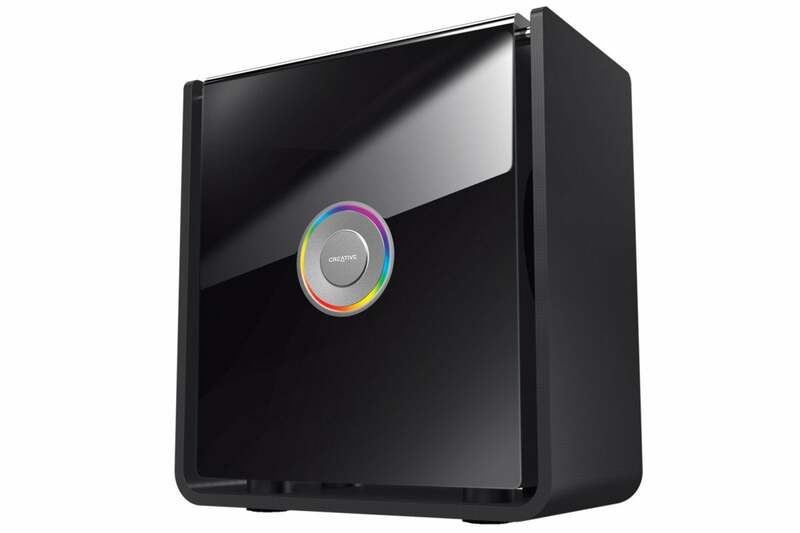 The Sonic Carrier has a dual-band 802.11ac Wi-Fi adapter onboard, as well as a gigabit ethernet port in back. You can also stream music via Bluetooth 4.1, with support for the aptX (but not the aptX HD) codec. If you set up the speaker on a console in front of your TV and discover that it blocks the TV’s infrared receiver, you can plug in an IR blaster to pass the signals from your TV’s remote through from an IR receiver on the front of the speaker. 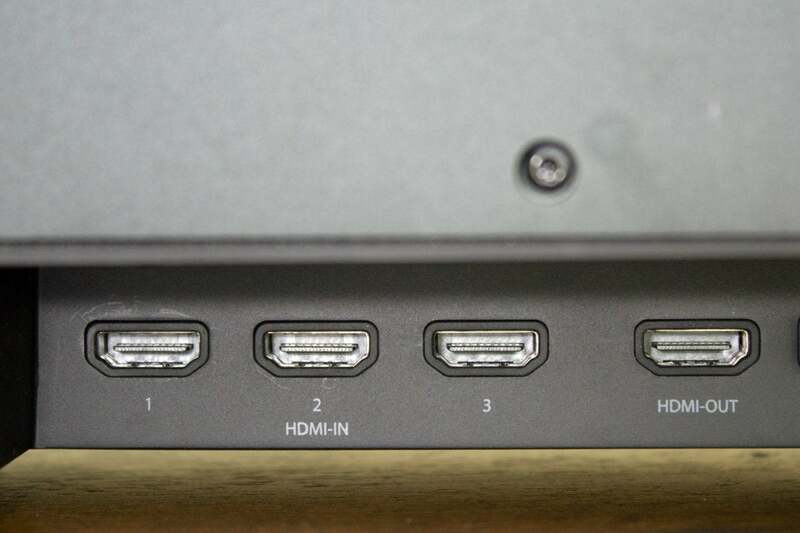 Three HDMI inputs and one HDMI output are on the back panel. A 64-bit quad-core 2GHz ARM Cortex A-53 CPU with access to 2GB of RAM and 16GB of flash storage enables the Sonic Carrier to use the Android 5.4 (Lollipop) operating system. The CPU is supplemented by a Mali T720 graphics processor capable of supporting 4K Ultra HD video (3840×2160), but it’s limited to a maximum refresh rate of 60 frames per second. You can also plug a Chromecast or Amazon Fire TV Stick into the soundbar, but I didn’t evaluate that feature. Incoming stereo audio signals are fed to a quad-core X-Fi digital signal processor (analog signals are converted to digital, first). The X-Fi chip upscales these streams to 24-bit/192kHz resolution and then splits them into a 7.1 stream (front left, right, and center; height left and right; surround left and right; and low-frequency effects). The digital audio output from the processor decoding Dolby Atmos (and with an upcoming firmware update, DTS:X) is sent to the X-Fi DSP, too, where it’s also upscaled to 24-bit resolution. From there, the audio signals are sent to a second DSP that subjects the audio to Creative’s various effects algorithms (if you want them). This diagram shows the paths audio, video, and data signals travel through the X-Fi Sonic Carrier. This second chip also splits the digital audio into 16 bitstreams—one each for each driver in the soundbar and one for the subwoofer. These signals are routed through a pair of digital-to-analog converters, amplified, and output to the midranges and tweeters in the soundbar. Low-frequency effects (LFE) remain in the digital domain, so they can be sent to the wireless subwoofer where they’re converted to analog and amplified. A smallish flip-up LCD displays brief status messages, but the graphical user interface that’s displayed on your TV via HDMI is much more useful. The GUI looks very basic—almost crude—but it is extremely responsive. The provided infrared remote has a D-pad that can be used to select a grid of icons with multiple button presses, or you can activate a mouse-like function and move the cursor by holding the D-pad in the direction you want it to move. Creative also gives you the option of plugging in a USB dongle for a wireless QWERTY keyboard. This small hinged display reports the Sonic Carrier’s current status. The company sent one equipped with a trackpad with my review unit and I found it extremely helpful, especially for typing in URLs, for search, and for entering login credentials for online services. The full Chrome browser comes pre-installed, along with Netflix and YouTube for video streaming, and Spotify, Tidal, Deezer, and TuneIn Radio for streaming music. You can load third-party apps from the Google Play Store, but Creative says its primary intention in using Android is to provide the foundation for its user interface and Creative’s own apps. You can control the Sonic Carrier three ways, and you’ll probably find yourself using a combination of all three at once. 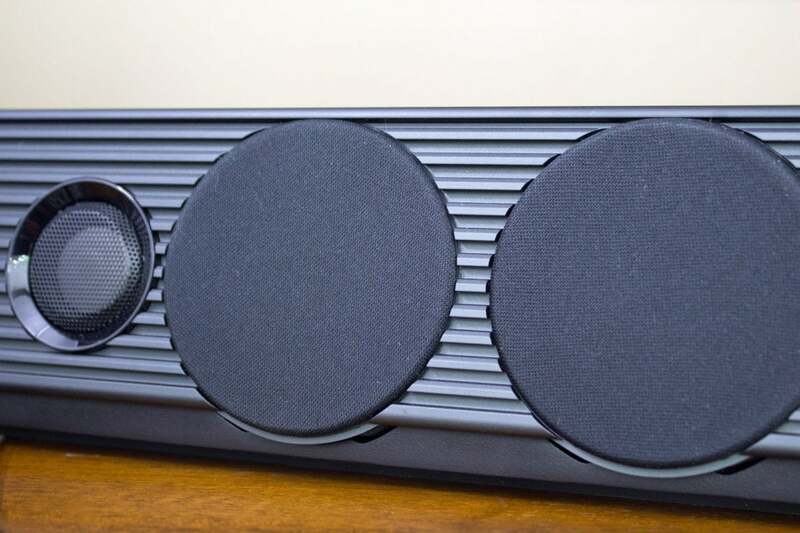 You can press physical buttons on top of the speaker to control most of its functions: switching input sources, adjusting the volume, controlling media playback, and lots more—including controlling the LEDs on the subwoofer. A 33-button infrared remote offers the same functions plus many more, including a mouse function for interacting with the GUI. At this price, I expected the remote to have backlit buttons. It doesn’t and is therefore useless in a darkened room. Lastly, you can use the mobile app, which is available for Android and iOS devices. The infrared receiver pulls double duty, receiving commands from the Sonic Carrier’s remote and passing commands from your TV remote through to an IR blaster you plug into the back. For playing music I’ve ripped from CD, encoded in FLAC, and stored on a NAS box, I typically used the IR remote to browse Plex Media Server running on a WD My Cloud Mirror. But I’d then switch to the mobile app to choose the DSP algorithms, because the physical remote only lets you turn the X-Fi effect on and off. The mobile app, meanwhile, only allows you to browse storage local to the Sonic Carrier; you can’t browse music on a server or access online music services such as Spotify. You can stream from Spotify (or any other service) on your mobile device to the speaker via Bluetooth, but it’s far better to run the Spotify app on the Sonic Carrier itself: You get the benefit of the TV display, and you don’t need to leave your phone within Bluetooth range of the speaker. I watched a couple of 4K Ultra HD Blu-ray movies with the X-Fi Sonic Carrier: Star Wars: The Last Jedi and Mad Max: Fury Road in my home theater, using an Xbox One gaming console for transport and a 55-inch Samsung Q7F quantum-dot TV as a display. While I do have a Dolby Atmos-capable A/V receiver (an Onkyo TX-NR737) connected to a 5.1 speaker system, I don’t have height speakers installed in my ceiling. One tweeter and two mid-ranges handle the left front channel (same for the right).. But as I said earlier, I’ve also been evaluating a Focal Evo Sib Dolby Atmos speaker system, so I compared the Sonic Carrier to that. The front left/right speakers in this system have separate drivers in the tops of their cabinets that—like the Sonic Carrier—are designed to bounce height audio cues off your ceiling to simulate ceiling-mounted speakers (you connect two pairs of cables to these speakers, so that the up-firing speakers are amplified separately from the front-firing ones). The soundtracks of both movies sounded good on the Focal speakers, but they sounded great on the Sonic Carrier, rendering dialog crystal clear in even the most action-packaged scenes and with bass response from that massive subwoofer penetrating deep to my core. There’s just a couple of problems: First, my ears didn’t perceive any audio effects coming from above with either system—and that’s the whole point of Dolby Atmos. In both cases, I placed the speakers in an open space in front of my TV, so nothing above them would block the soundwaves from reaching the ceiling, but I don’t think either system could go the distance (6 feet 9 inches for the Sonic Carrier, and 5 feet 6 inches for the Focal). You can control almost everything, including music playback, with buttons built into the top of the aluminum enclosure. Second, the Sonic Carrier was only rarely able to fool my brain into hearing any audio effects as emerging from anywhere other than the front of the room. In The Last Jedi, it was in the scene where Rey hears the whispering voices that lead her to the building housing the last original Jedi texts. Creative’s speaker was also effectively immersive in the cave scene where Rey confronts her mirror images and snaps her fingers. The Focal system, which has genuine surround speakers that, yes, must be hardwired to your receiver, was much more effective in this regard. How could it not be, with those speaker cabinets placed right next to my listening position? Ironically, the X-Fi Sonic Carrier delivers a far better performance with music in stereo than it does movie soundtracks in surround sound. This soundbar delivered impeccable reproductions of tracks encoded in FLAC, but it was supremely impressive streaming 320Mbps tracks from Spotify. I typically prefer to listen to music unadulterated by DSP algorithms emphasizing frequencies in ways the artist might not have intended, but once I enabled X-Fi mode, I found I didn’t want to turn it off. The algorithm opened music up and presented it on a wide sound stage that sounded positively live. The X-Fi Sonic Carrier has a powerful digital signal processor onboard. The best way to tap it is via the app. The Sonic Carrier offers five broad DSP experiences: Audiophile Music, X-Fi Super Wide, Movie, Gaming, and TV Series. You can enable various subsettings for several of these presets. There are four for Audiophile Music, for instance: Direct mode, in which the original signal is passed through without any digital signal processing at all; 15.2 Focus manipulates the original sound signature just enough to broaden the sound stage so it sounds like it’s coming from a pair of speakers spaced farther apart than the Sonic Carrier’s physical width; 15.2 Wide is a wider soundstage using the full 17-driver array—think Space Balls’ Ludicrous speed—and finally, there’s 15.2 SuperWide, an even wider sound stage. Yes, at that point you will have gone Plaid. Creative also exposes many of the system’s DSP knob and switches, figuratively speaking, so you can tweak the speaker’s performance to your personal taste. But you’ll need to turn to the X-Fi app for this, which can lead to a confusing dance until you get the hang of which tools control which features. Your actions are executed immediately, however, and they’re reflected on the TV’s display as well as in the app (well, some of them are—the GUI doesn’t have all the elements the app does). 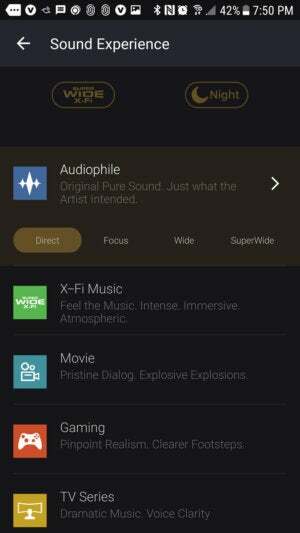 You can apply varying amounts of the Dolby Atmos effect to music by dragging your finger around a circle in the app, for example. And you can choose from 15 EQ presets (acoustic, classical, hip hop, rock, et al) or create your own, either by dragging bass and treble sliders with your fingertip or adjusting frequencies along 10 points on a curve. 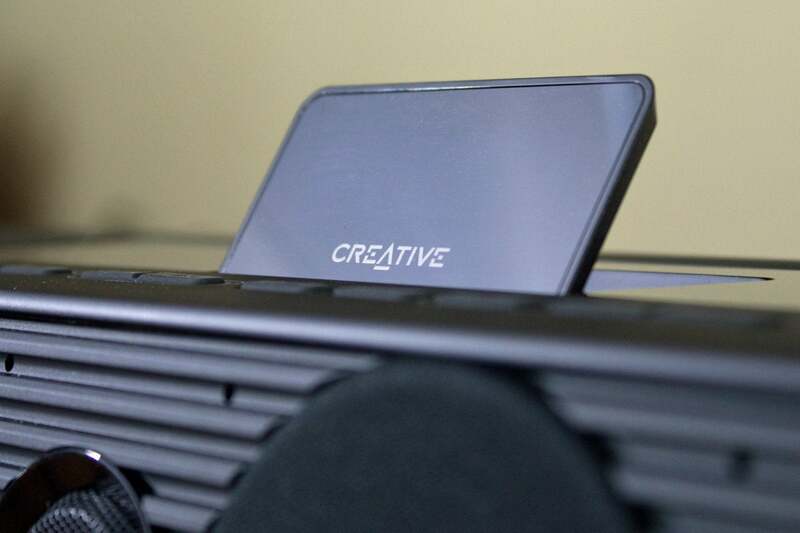 Creative provides three slots for storing custom IQ settings. 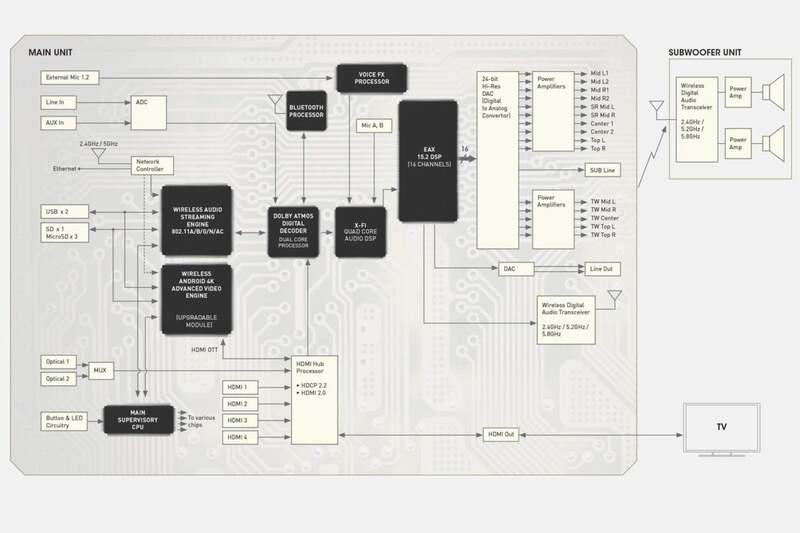 This exploded view of the X-Fi Sonic Carrier shows the 15 discetely powered and controlled drivers in the soundbar itself. Apologies for taking so long to answer the question I’m sure everyone wants to ask: Is the X-Fi Sonic Carrier worth $5,800? If you’ve read the entire review, you’ll know that I’d answer with a highly qualified yes. The hardware justifies the price tag, as does its performance with music. This audio system will move you like few others can—at any price. If you want an audiophile audio system virtually free from wires, the Sonic Carrier will scratch that itch. 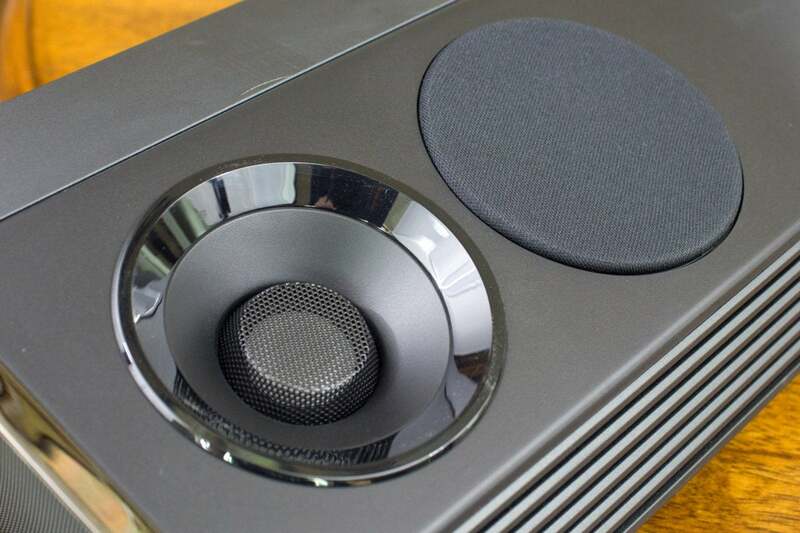 But home theater in general—and immersive sound in particular—is the Sonic Carrier’s raison d’être, and that’s the one application where I found its performance wanting—at least in comparison to comparably priced conventional Dolby Atmos audio systems. It never fooled my ears into believing sound was coming from anywhere other than the front of my home theater. If you find wires anathema, or just impossible to deal with due to your home’s construction, you might find the immersive-audio compromise worthwhile. I don’t have that problem and I won’t settle.